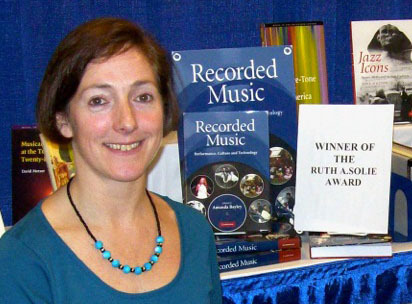 In November 2011 Amanda received the Ruth A. Solie Award for her latest book, Recorded Music: Performance, Culture and Technology, published by Cambridge University Press in 2010. The award was made by the American Musicological Society for “a collection of essays of exceptional merit”. Recorded Music is described by Margot Fassler, Chair of the Award Committee, as: “A pioneering collection, building on and surpassing the theorising of Walter Benjamin and Theodor Adorno on the ways we think about and study recorded sound. Recorded Music heralds a shift towards sound studies and resonates with many observable directions in the field today, from studies of stagings, performances, rehearsals, the physicality of playing instruments, and issues surrounding multiple takes. The American Musicological Society (AMS) was founded in 1934 to advance research in the various fields of music as a branch of learning and scholarship. 3,600 individuals and 1,100 institutional subscribers from over 40 nations participate in the Society. ‘The polyphony of perspectives presented here is likely to generate a good deal of interesting discussion among graduate students, whilst the accessibility and concise nature of the chapters as individual accounts makes this a very useful tool for teachers of undergraduate courses.’ British Journal of Music Education.